Uncork your favorite vintage with ease using a Professional Wall Mounted Corkscrew in Excellent Condition. This wall mounted corkscrew can easily be mounted on a flat vertical surface, providing extra stability when uncorking even the toughest of bottles. Just lower the handle to screw-in and rise the handle to lift the cork. 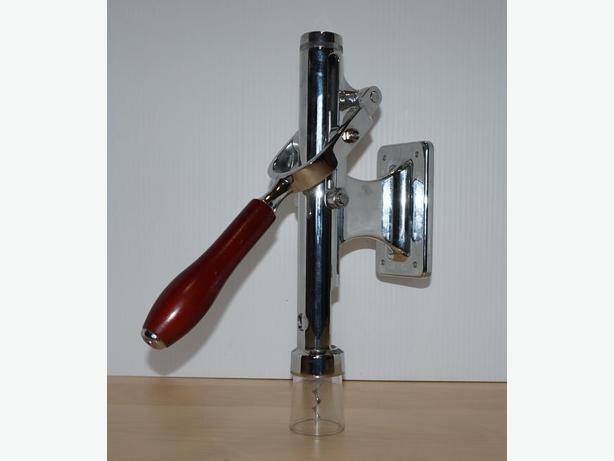 This corkscrew would be the perfect permanent fixture in your wine cellar, bar, or restaurant! Its body is made of chrome-plated metal with a wood handle. The dimensions are approximately: 13-in high by 10-in deep by 3-in wide. Pick up only from Cobble Hill.